I am not fruitless anymore. Through the writing, learning and practicing of the past 6 years, I have come out the other side with more wisdom, creativity and passion than I knew was possible. I know I am not alone in this type of transformation. Everyone who enters the decade of being the age of 40 comes through it changed. I didn’t realize how much better I would feel and how much more I like myself as I move through these transitions. This e-book represents an overview on 10 topics that I feel are essential at this time of life. This is my story, so far, meant to provide inspiration and encouragement about each of these areas for further personal exploration and maybe discussion. For I am still learning each and every day. Do I say nice things to myself? Who did I connect with today? Have I practised creativity today? I hope you will join me on this important journey. I want to start a global conversation about creativity and the role it plays in our everyday lives. I think this is a critical topic. If we light this spark and start to see more of our ideas come to completion, imagine the world we can create? This transformation starts with how we feel about ourselves, the creative practices in our homes and the love and care for our relationships. We will be the change we want to see in the world. I am sure of it. Join me by celebrating your creative journey with my e-book: Fruitless at 40: Rediscovering my Creative Power. Add your voice to the survey – What does creativity mean to you? Please feel free to share this post with your network. What is your creative superpower? If a child was asked what their superpower was, they would wonder why they had to pick just one? This child could easily convey their strengths, listing them off one by one. They would not feel too boastful. They wouldn’t worry what the person who asked the question thought about their unique superpowers. This child might even think it ridiculous to worry about such things. At what age did we loose the ability to easily identify what makes us feel special? Why is naming our valuable contributions to the world such a vulnerable process? I think a world where we knew what we were good at and what we struggled with would be a special place, maybe a utopia of sorts. Just think of what could be gained from this kind of honesty and co-operation. Instead of putting others down for admitting a weakness, we could match that characteristic up to another’s strength. We could act as if we cared for one another and that solving problems together, was of utmost importance. Since it is a bit of a leap to think of a single superpower, let alone what a creative one might be, I’ve shared mine. You might wonder what this list of qualities has to do with creativity. I think these things are the foundation of my creativity. Without them, I would not know where to start. It is by knowing where to begin that I can eventually get into the flow state, where the magic might happen. As I look over the words on the left and compare them with the words on the right, an interesting pattern appears. If I practice a healthy measure of being ‘curious’, I am in a good place. It is when that goes too far with ‘too many questions’ that I get into trouble. Knowing when to draw the line seems to be the key, a skill I am always working on. I have many other things I am working on. Ideas and practices that have become quite important to me as I move into this midlife phase. I have discovered, by accident that this is a highly creative time, probably more than any other time before. What a wonderful surprise to find that being more creative has empowered me in all areas of my life. Take my survey – What does creativity mean to you? If you have done all those things already, thank-you. I am deeply touched by the honesty of the comments and feelings being expressed about creativity. It is such a passionate topic to be discussing. More information about Who is CW can be found at Daily Creatives, along with a bunch of other great content. How long is each creative session? The next group of popular responses are to give an amount of time, but that varies from minutes to hours. There are many people who didn’t answer this question, presumably because they didn’t feel they spent a discernible amount of time doing creative things. My favourite answers can be best be summarized by saying that “creativity is my life“. There is no separation between time spent creatively or time spent on anything else. If I was taking the survey, I’m not sure I would have answered that way. I don’t know if I feel confident enough in saying “creativity is me, all the time”. Although I aspire to that. Maybe ‘creativity’ will be my word for 2017. That thought brings a smile to my face! In reference to creativity, I have written a book called, “Fruitless at 40: Rediscovering My Creative Power“. 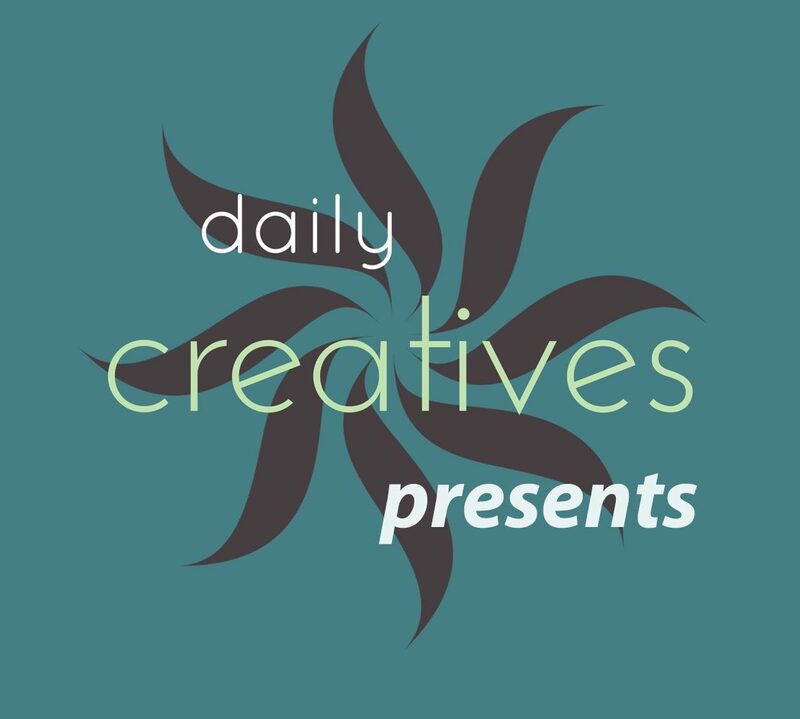 Check out Daily Creatives and consider leaving your email. I would love to send you updates on my creative journey! A couple of years ago, one of my New Years resolutions was to start meditating. Even back then, everyone seemed to be talking about the amazingly restorative powers of meditation. But how was I going to accomplish this? The first quarter is a very heavy travel season for me at work. Almost immediately after the Christmas holidays end, I am off on my first long haul flight of the year. I found a resource through the Tim Ferris podcast. Her name is Tara Brach. I love the timber of her voice. I was calmed by her guided meditation and felt good when I was finished. I could easily commit to a 20 minute session from my hotel room. That is the only upside of travelling alone. No extra responsibilities. Early on in my practice, one of Tara’s meditations used the following passage from Rumi. I liked this so much, I wrote it out from the podcast audio. (I didn’t realize I could just google a few of the lines and have the poem instantly). The reason I find this so interesting is that for many years, I have had a similar guiding assumption about myself. Though, I never took the time to stop and think too much about it. I also didn’t connect the dots. My issue with eating too much of the wrong kind of food was one thing. Driving myself professionally at a very high level was another. Sacrifices I was willing to make for my job, another thing again. They were all separate and unique line items. I listed these things rather than connecting them. Well maybe I would have come to this analysis sooner than today if I had kept up my meditation practice. Sadly I dropped it because I felt it was too much extra time on top of the 30 minutes I had set aside for training. Hmmm, that reasoning seems so weak as I write it now. Anyway, join me – out beyond ideas of rightdoing and wrongdoing. I’ve published an e-book called, “Fruitless at 40: Rediscovering My Creative Power“. If you have not expressed your voice on the subject of creativity, I would love to hear your thoughts in my survey. How often do you practice some kind of creative activity? Close to half of the respondents to my survey have answered this question with “weekly”. Over 30% claim a daily practice, with the least popular answer of “monthly” coming in at an even 25%. I think this shows that even with such busy lives, we are able to carve out some time to work on creative projects. Based on the comments, there is a group of people who don’t really distinguish creative time in their life from any other time. In other words, they associate creativity in some measure to anything and everything they do. This is a really interesting concept which I will touch on in greater depth in my upcoming book. I am starting to put myself into the “creative all the time camp”. But it has been a journey to get to that point. As of 6:30am on the West Coast, there is 97 responses on my survey. My target was 100, which I am sure to reach. Thank-you to everyone who answered the questions, the extra comments are bits of gold, which I treasure. I’ve been a part of survey’s like this before at my job. The task was to ask ski resort staff to comment on certain aspects of their uniform, which my company was providing for them. Well over half of the respondents took some care to write long comments about the uniform, performance and features they wish it had. The experience felt like Christmas morning, reading through the heartfelt sentiments. This survey has been even more intimate. One person used the word vulnerable to describe the creative process. I totally agree and it makes me even more thankful that so many people would open up their private thoughts on this subject. I look forward to more discussions in the coming weeks. Thank-you again for your participation. Happy creating! Do you enjoy these creative practices? Question #3 from my survey; this one is super interesting. When I put up the multiple choice answers, I focused on the things I was most interested in at the moment. I was curious to see the other ways people practice a creative spirit. (Maybe I should have phrased it that way!) In any case, the comments reflect many other activities and even, “ways of being” which are self defined as creative. I love it. Just the spirit I was hoping for. As of 8am West Coast time, the survey has 37 responses – excellent! Thank-you so much for taking part. If you have not joined in yet, please add your voice to the conversation. Amazing honesty in the responses, thank-you so much. I am honoured to be connected to so many creative people. Rightly so, many times it has been noted that “creativity is a way of life”. For many of us, it can’t be separated from our daily life. It is present in everything we do. I think that is pretty evident by this list. Speaking of creative projects, enjoy these photos from a recently completed silk scarf I knitted. The pattern and yarn came from LoopsClub in Tulsa. I’m a member who receives a kit each month. Because there is always another project on it’s way, I stay focused on getting projects finished. For me this is a good incentive. Otherwise projects sit on needles for years, waiting for me to complete them.